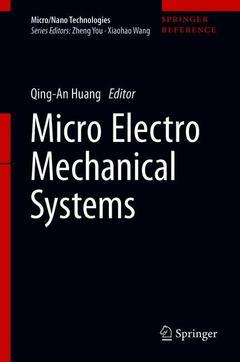 This handbook volume aims to provide a comprehensive, self-contained, and authoritative reference in MEMS. It covers the theoretical and practical aspects including but not limited to sensors, actuators, RF MEMS, micro fluids and bio MEMS systems. It is particularly recommended to undergraduates, postgraduates, researchers, scientists, and field experts. This comprehensive summary will provide a solid knowledge background and inspire innovations in this highly interdisciplinary field. The handbook series consists of 5 volumes: Micro/nano fabrication technology, MEMS, Nanomaterial, Nanomedicine and Applications of micro-/nanotechnologies in IT. Experienced researchers and experts are invited to contribute in each of these areas.The series is published under Springer Major Reference works, which allows continuous online update and publication. These features allow newcomers and other readers to keep in touch with the most up-to-date information in micro-/nanotechnologies.It presents an overview of the knowledge base, as well as selected topics and provides comprehensive and authoritative information on the field for researchers, engineers, scientists and graduate students who are involved in different aspects of micro-/nanotechnologies.This publication will provide inspiration for innovative research and application ideas for continued growth of the field. Device Physics.- Scaling effect.- Sensors.- Actuators.- RF MEMS.- Micro fluid and bio MEMS.- Integration techniques.- Micro systems. Prof. Zheng You is currently a professor in Department of Precision Instrument in Tsinghua University, Beijing, China. He is also served as the director of Micro-Nano Technology Research Center, Tsinghua University and State Key Laboratory of Precision Measurement Technology and Instruments. He has been elected as an Academician, Chinese Academy of Engineering since 2013. Prof. Zheng You’s main research interests fall in micro-nano technology, MEMS, Satellite technology, and measurement and instruments. Prof. Xiaohao Wang is currently a professor in Department of Precision Instrument, Tsinghua University. He also serves as Associate Dean of Education and Director of the Division of Advanced Manufacturing, Graduate School at Shenzhen, Tsinghua University, and executive vice secretary general of the Chinese Society of Micro-Nano Technology (CSMNT). Prof. Xiaohao Wang received bachelor degree and ph. D both from Tsinghua University in 1994 and 1999, respectively. During 1998 to 2001, he joined the Department of Precision Instrument in Tsinghua University as an assistant professor, and was promoted to associate professor in 2001. During 2007 to 2008, he was a visiting scholar at Technische Universitaet Berlin. In 2010, he became a professor of the Department of Precision Instrument in Tsinghua University. His research interests cover MEMS based sensors, actuators, ionizing sources and portable Mass Spectrometer, Ion Mobility Spectrometer, High-Field Asymmetric Waveform Ion Mobility Spectrometer. He has published over 100 technical papers and applied tens of patents in the area of MEMS and the portable instrumentation.